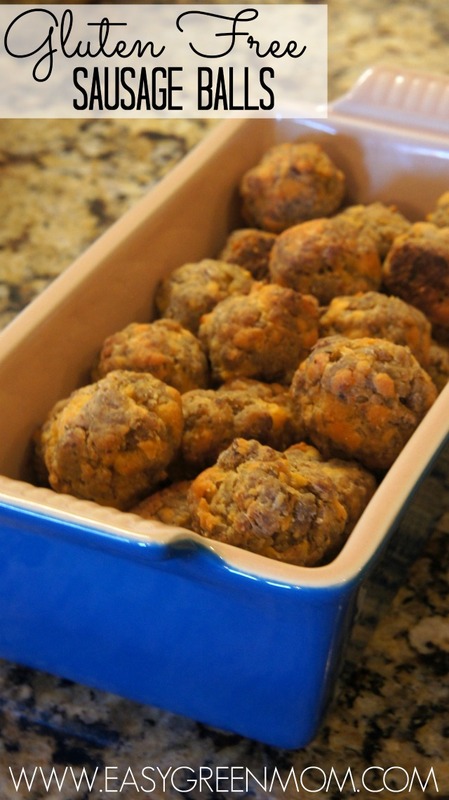 Sausage Balls are a signature snack for most my families parties. My mom makes them every Christmas morning and we have them at all our Showers (bridal or baby). Not wanting my husband to miss out on all the wonderfulness of the Sausage Balls (because he cannot have gluten) I always make him his own batch. Yes, I know…I’m an awesome wife! Important Note: Be careful when purchasing your sausage if you do have a gluten intolerance. Some sausages use gluten or high MSG which can bother those with a gluten intolerance. 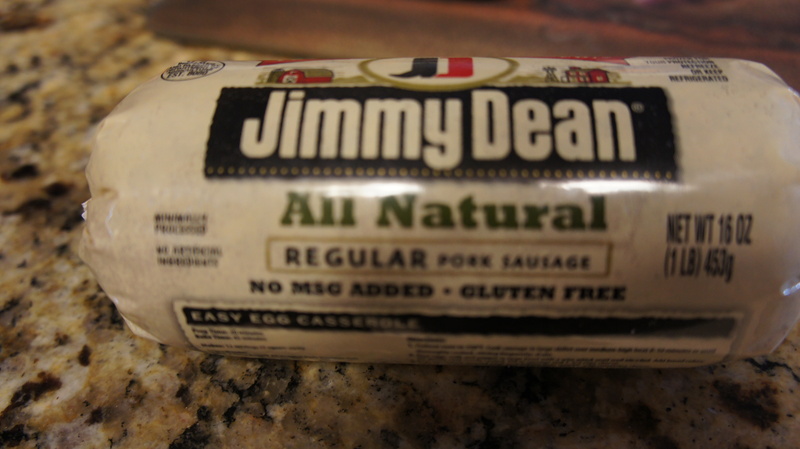 I used Jimmy Dean All Natural Sausage. It says Gluten Free and No MSG added on the label. Easy to make and so yummy to eat! Perfect finger food for any party or get together! Scoop with tablespoon and roll into a ball and place on a greased baking sheet. *The GF Bisquick is a lot finer then regular Bisquick so mixing may take longer then expected. I find using both hands to mix works best. You may even have little baking mix left at the bottom of the bowl that just won’t mix in. That is ok! Where do you buy gluten free Bisquick? I get my gluten free Bisquick at my local grocery store in the gluten free section. I have never made sausage balls before. In fact I don’t think I’ve eaten them either, but I had some sausage in the fridge and GF Bisquick in the freezer and decided there had to be some way to use both ingredients. I wasn’t really certain what the consistency for these was supposed to be as I mixed the ingredients together but the Bisquick simply was not mixing with the sausage. So I beat one egg and added it to the mix and everything folded together nicely. I also didn’t have shredded cheddar, so used shredded Swiss. I also kicked up the sauce with the juice of one lime and a teaspoon of horseradish. I thought this turned out great! The balls were moist and paired well with the sauce. I only made half a recipe which was plenty for hubby and me. I can’t wait to make these for a party! That sounds great Christin! I will have to try your improvised recipe! Also, the Bisquick will not mix without the cheese to help it stick so adding an egg was a great idea! Use a little buttermilk and they will mix better. I do this with regular sausage balls also and it makes them moist. The gluten free was a little harder to work with but they were still very tasty. Will Pamela’s GF pancake mix work? Pamela’s Ultimate Baking and Pancake Mix would work too. Very excited to see your GF take on typical southern dishes. Thanks! Nice and simple – thank you! I’ve got some in oven now. Because the GF Bisquick is high in carbs, I cut it by 2/3 and replaced the remaining needed flour with equal parts almond flour, flaxseed meal and whey protein (plus 1/2 t of baking powder). I added garlic & onion powder to help “cover” the somewhat nutty taste. Great recipe! I used Bob’s Red Mill’s new gluten-free 1-to-1 baking flour. I also added in a splash of water because I couldn’t get the balls rolled tightly. I added garlic powder, onion powder and 3 stems of green onion, finely sliced with kitchen scissors. Delish! Just made a huge batch for a recital reception, and they are delicious! I made a test batch the day before and thought they were a little dry, but I rolled the rest and put them in the refrigerator to cook the following day and the pre-rolled ones cooked up with a little more moisture/fat content, possibly because the flour mix had a chance to absorb some of the oils from the cheese and sausage?? At any rate, they are great. Thanks for the recipe. New to g/f cooking, but I had a half-pound of sausage in the refrig. and some grated sharp cheddar and some Krusteaz (I think?) g/f flour. 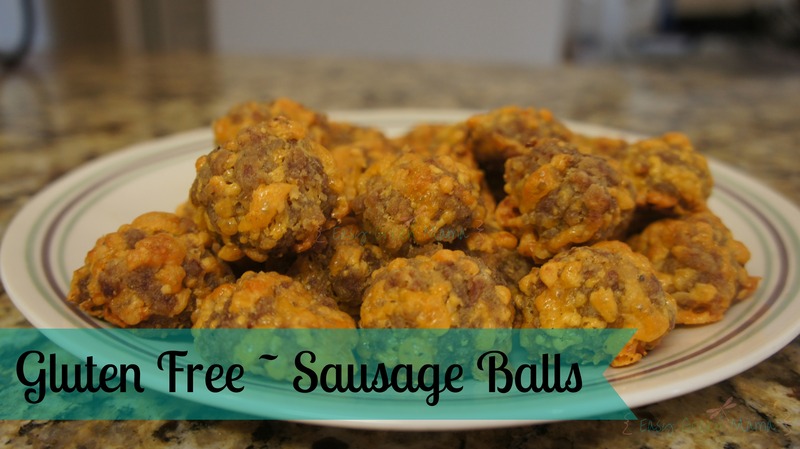 Think I will try it since we really liked the “normal” sausage balls! Thanks! I made these today. I added an egg and mixed really well.. they are delicious….. This just needs a binder. The gluten free Bisquick just doesn’t behave the same way (the potato starch). I used one egg and 1/2 a cup of buttermilk. MUCH better. I did have to increase baking time 5 minutes. Glad you made it work! I agree the GF Bisquick needs a binder; I’ve been using Pamela’s and it does fine without the addition of an egg. But, I like the idea of adding buttermilk, I may try that next time I make these! Thanks for stopping by! No, you mix raw sausage with the cheese and then mix in the bisquick. I am making them right now, using a kitchenaid, which makes it a lot easier And faster then when I mixed by hand. This time I am trying a splash of milk in it as suggested in the earlier comments.